The candidate isn’t telling the whole truth about his family. He claims that in 1959, his father came to America to find something he couldn’t find anywhere else, and that he did so thanks to the generosity of an American icon. He was the “son of exiles,” he told audiences, Cuban Americans forced off their beloved island after “a thug,” Fidel Castro, took power. There’s a distinct lack of long quotes in that description. Marc Caputo explains why: Rubio has not explicitly said that his parents fled Cuba because Castro took power. They left Cuba in 1956, returning occasionally. Castro took power in 1959. The Rubios stopped coming back in 1961. Rubio has said things like “in January of 1959, a thug named Fidel Castro took power in Cuba and countless Cubans were forced to flee and come here, many — most — here to America.” He’s gotten the date of their exile wrong: He told a softballing Sean Hannity that “my parents and grandparents came here from Cuba in ’58, ’59.” Did that leave the false impression that his parents fled Castro? Well, it’s more vivid to imagine them escaping with the clothes on their back as the red noose tightened than it is to imagine them simply deciding never to return to the country. But the second version of the story retains Rubio’s point. Is an exile someone who flees his country when a dictator takes over, or someone who can’t return to his country because the dictator’s there? Both definitions work. 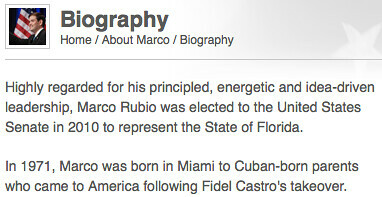 And in the “’58, ‘59” quote, Rubio isn’t actually saying they literally fled Castro. He’s unsure! When you compare the Obama story and the Rubio story, Rubio comes off better in all but one respect: He leans on the Cuban drama to make domestic political points. It’s a frequent Rubio trope, comparing this or that liberal priority to the stuff that turned Cuba into a Communist state. And that’s getting a little old. Passing Dodd-Frank isn’t like letting the workers control the means of production. 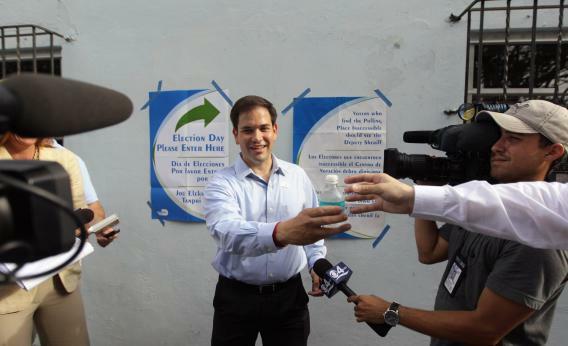 But the Rubios say that they couldn’t return to Cuba because they feared the country’s turn. That’s really not different than what Rubio has been saying for years. UPDATE: Matt Yglesias points out that the version of the Rubio story on his Senate website is just wrong. They didn’t come here following the takeover. They decided not to move back after he took over. Generally speaking, Rubio’s sin is that he doesn’t correct people when they write a more dramatic version of his biography. Not the same thing as making up the dramatic version himself, but he should definitely correct the website!